Actually, we’re not in blueberry season right now, but that’s not a problem, because you can swap to frozen blueberries, if fresh ones are not available. 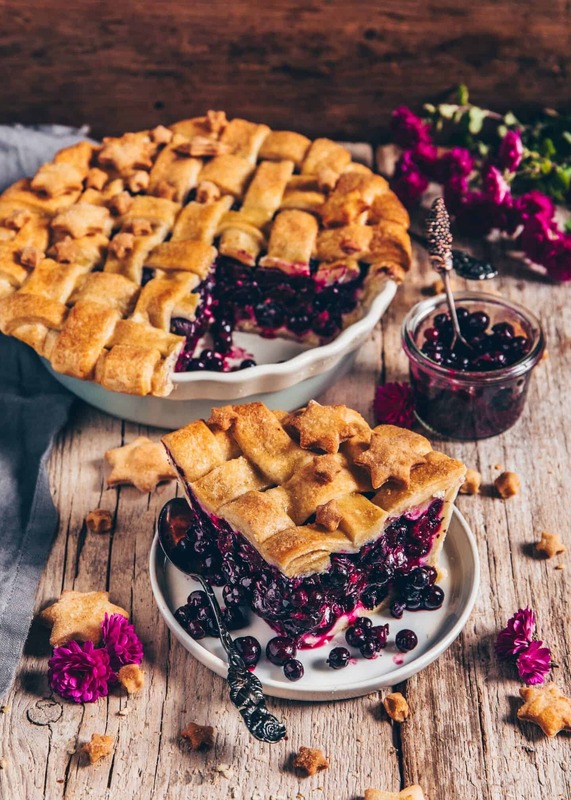 I just felt like I needed a delicious, warm blueberry pie, so I simply modified my cherry pie recipe and filled it with blueberries instead. Anyways, this best Blueberry Pie turned out so delicious, that there is no way I can deprive you of this easy recipe! 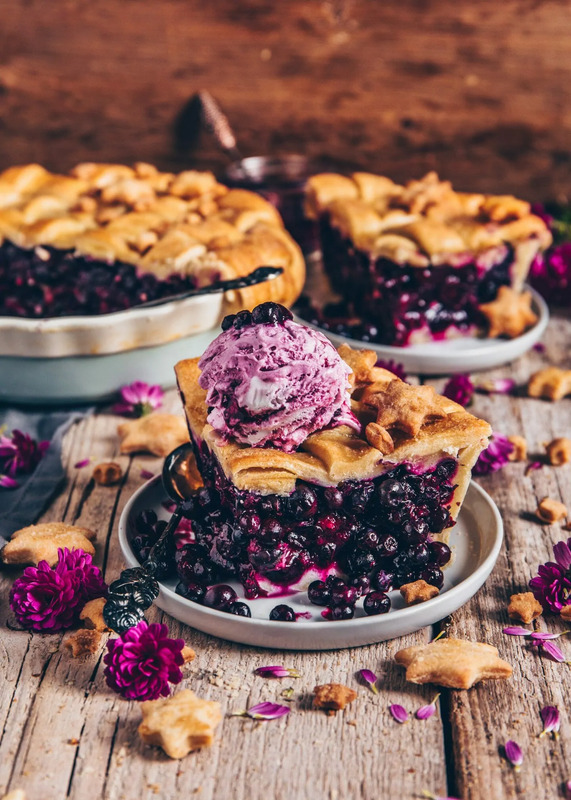 The BEST Blueberry Pie recipe! 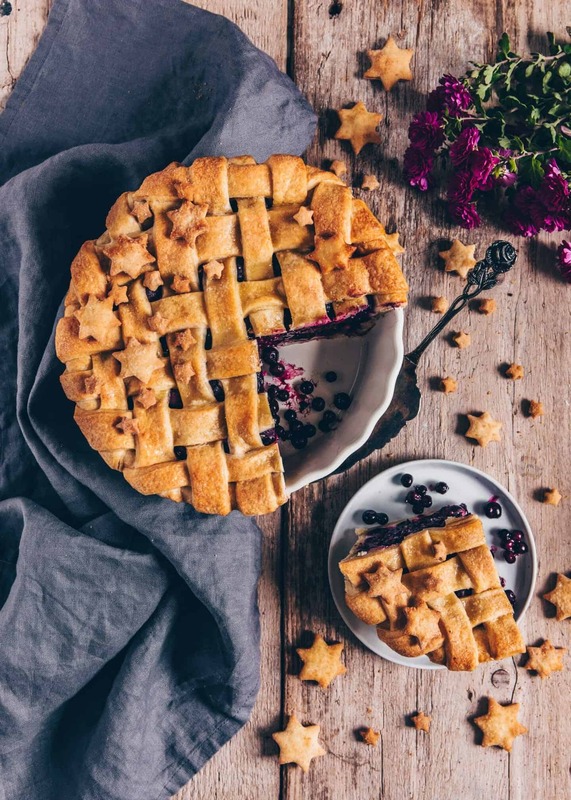 A crunchy, flaky, cookie-like pie crust on the outside meets a warm and fruity blueberry filling on the inside. How does that sound to you? 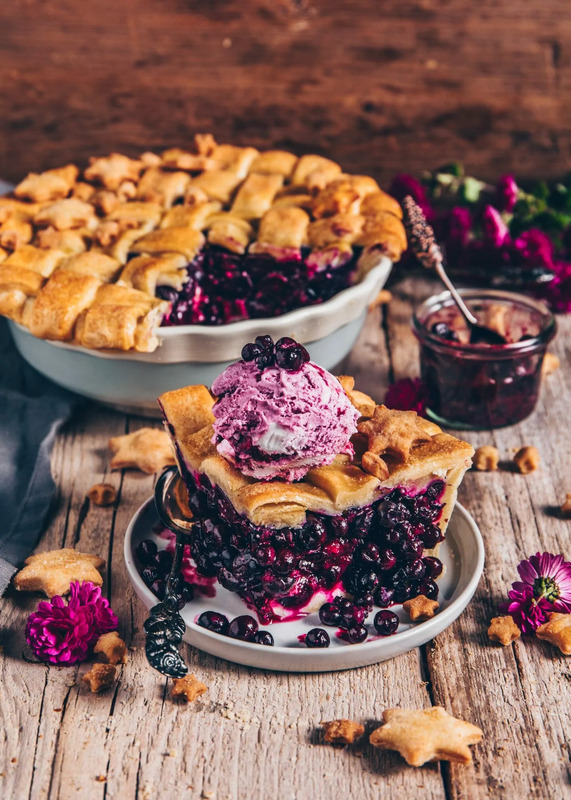 I can tell you this best blueberry pie makes blueberry dreams come true, even in the cold season. Unfortunately, there isn‘t a very versatile selection of fresh fruits and berries in winter. That’s why I’ve been baking a lot with apples lately. I love apple pie, no question, but there has to be a little bit of variety. I really love blueberries anyway, and especially when they’re warm. Somehow, the filling reminds me of freshly cooked homemade blueberry compote. 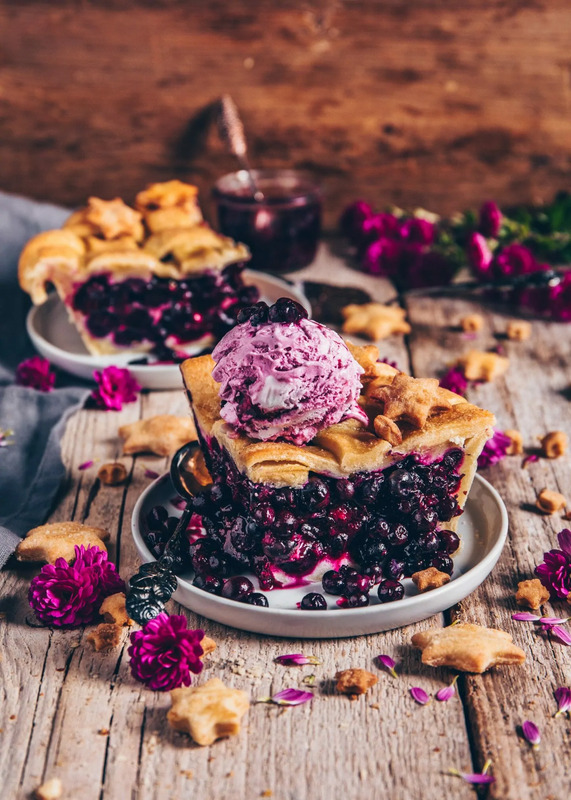 Add a scoop of vanilla ice cream or whipped coconut cream on top of your piece of blueberry pie, and you’ll feel like you’re in blueberry heaven because it tastes so heavenly! I could really drool over, over and over again! 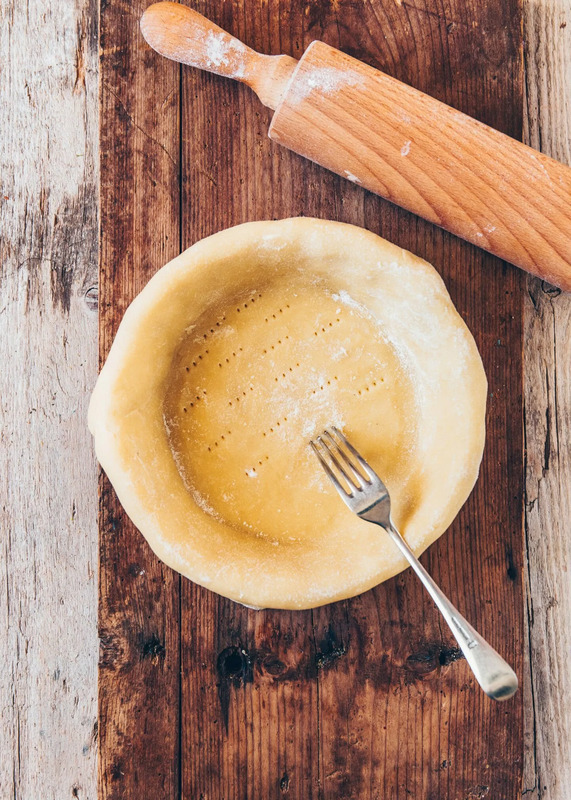 Homemade vegan pie crust is quick and easy to make! 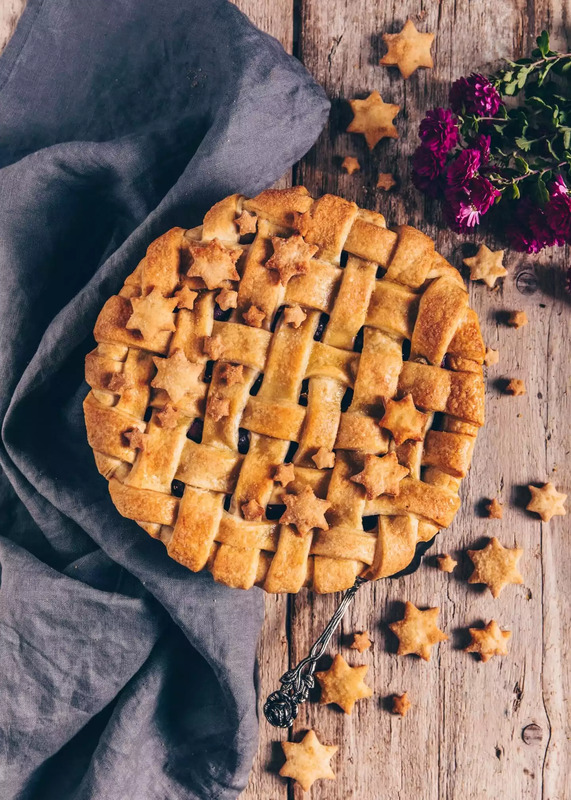 I personally, prefer to make the pie crust myself, because I like knowing which ingredients the pastry contains, that’s the beauty of making it yourself. The best is, that it’s also made super fast because the dough comes together in less than 5 minutes. You only need flour, (vegan) butter, a little water, a bit of sugar and a pinch of salt. That’s it! Depending on whether I want the dough more buttery or more dry, I often vary the amount of ingredients in my basic recipe. This time I have decided to make it more soft and I‘m very satisfied with the result. 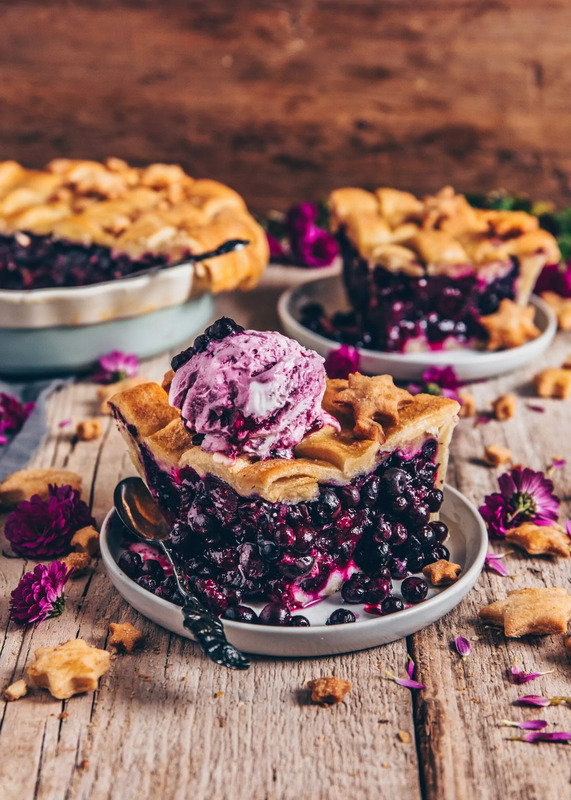 Of course, you can also use store-bought pie crust to make this vegan blueberry pie, if you prefer. 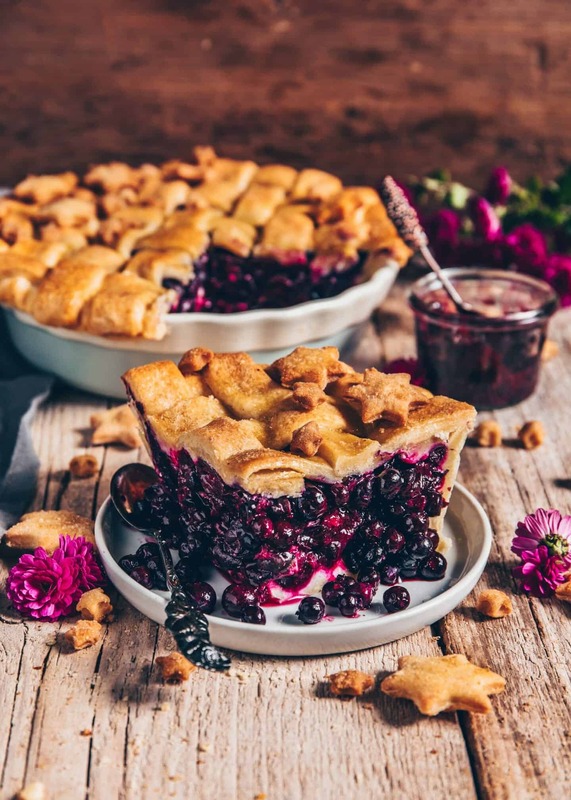 The filling for this vegan blueberry pie is super quick and easy to make. Best of all, you can also make it out of season by using frozen blueberries (I used these Canadian Wild Blueberries). You don’t even need to thaw them, you just simply put the frozen blueberries into a large bowl, and combine with starch, sugar, and a little lemon. Done! I think a pie is the easiest cake ever. At least no other cake comes to mind that is made faster. Start with dividing the prepared pie crust pastry into two halves, then roll out each half. Put one rolled out dough into the pie dish as bottom and use the other half of the dough to cover the pie. 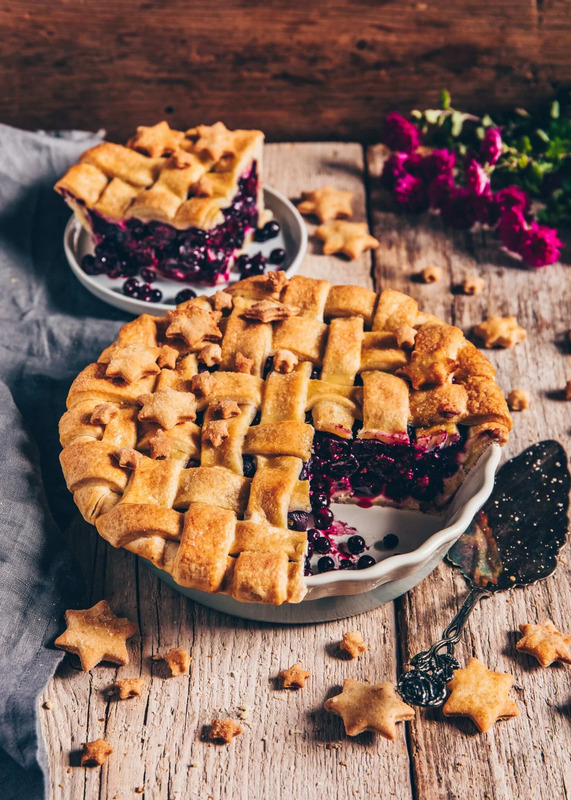 Cut this into strips using a pizza cutter or knife, then lay the strips on top of the blueberry filling to create a lattice design. Optionally, you can also cover the pie with the rolled dough as a whole. But please make sure to cut two slits in the middle of the top crust, so the steam can escape. Then divide the dough into two parts and shape each half into a disc. Then wrap in cling film and refrigerate for at least 1/2 hour. Put the blueberries into a bowl and mix with the sugar, cornstarch, lemon zest and lemon juice. Set aside. Roll out one half of the dough on a lightly floured work surface. Lay into a greased 8-inch (20/22 cm) pie dish and gently press the dough against the buttom and sides. Pierce the buttom crust several times with a fork and then fill in the blueberry mixture. 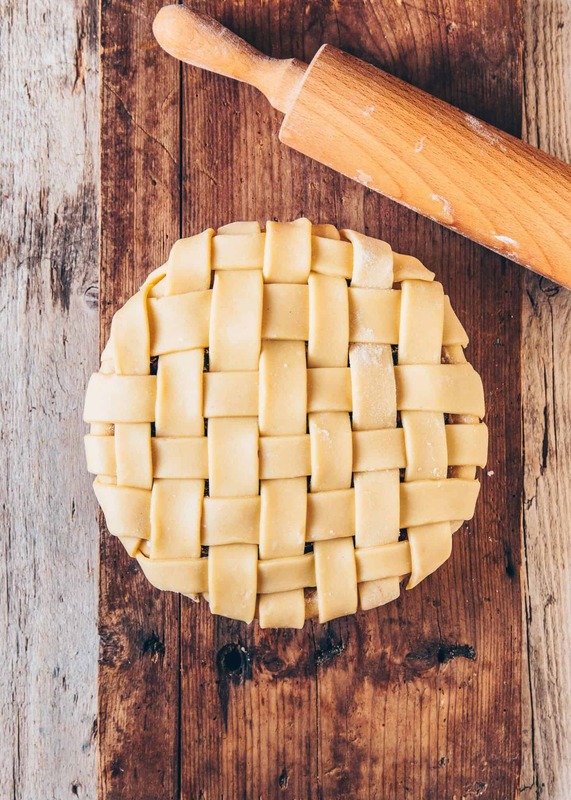 Roll out the other half of the dough, cut into strips and place on top of the filling to create a grid pattern (or optionally cover the filling with the rolled out dough as a whole *). Then cut off the overhanging dough and gently press the edges slightly to seal the sides. 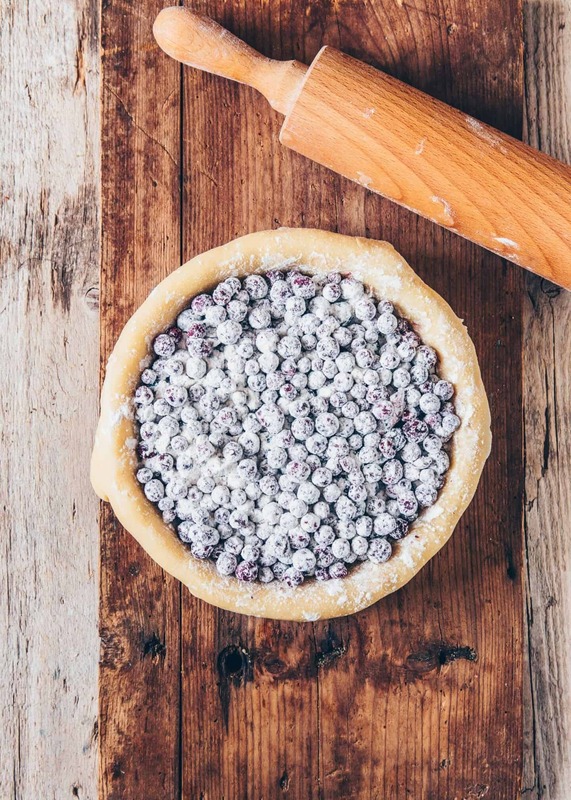 Optional: you can use the remaining dough to cut out cookies to make decorations for the pie. Form the rest of the dough into a ball again, reroll and cut out the desired designs using a cookie cutter. Then place on top of the pie and press a little, so they hold. Brush the top of the pie with a little plantbased milk / cream and sprinkle with a little brown sugar. Bake the cake for about 50-60 minutes until golden brown. If necessary, cover only the sides or the entire pie with aluminum foil, if the pie gets too dark during baking. Let cool the Blueberry Pie afterwards. Serve with a scoop of vegan ice cream, or whipped coconut cream, if you like! To make this cake GLUTEN FREE, you can use a gluten-free flour blend. To make this cake without refined sugar, you can use erythritol. Of course, you can also use coconut sugar or regular white sugar, if you prefer. 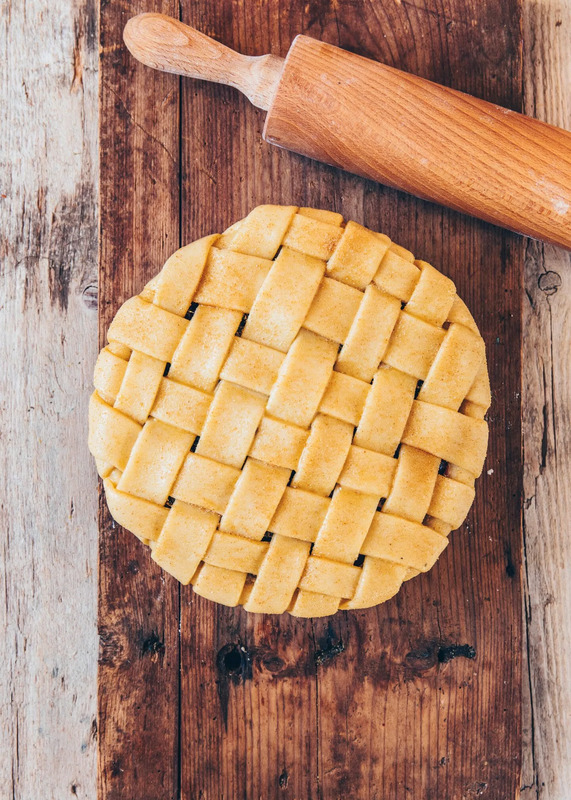 If you want to cover the cake with the entire rolled out dough (without cutting into strips to create a lattice design), then cut two slits in the middle of the top or pierce it with a fork a few times to let the steam escape. 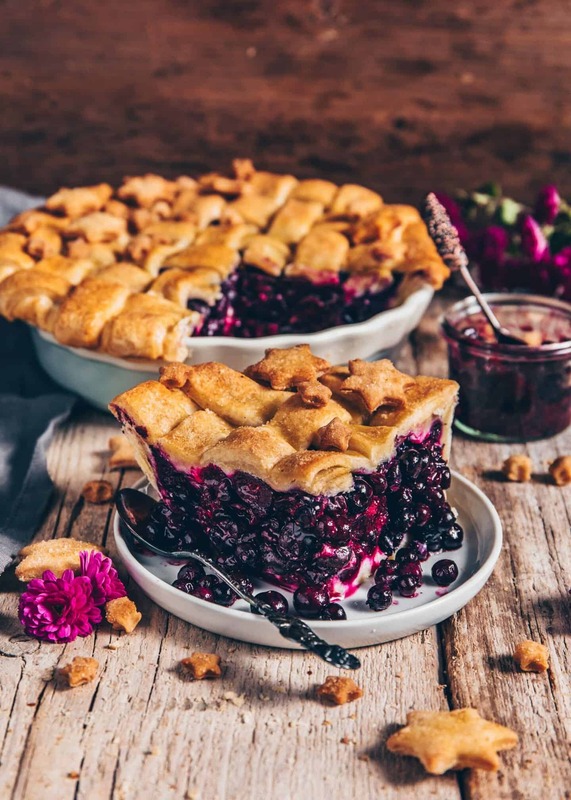 If anyone asks me, I would say this is the most gorgeous blueberry pie I’ve ever seen ❤ Brilliant photos! Bianca, this pie looks absolutely delightful! Perfect for the holidays! 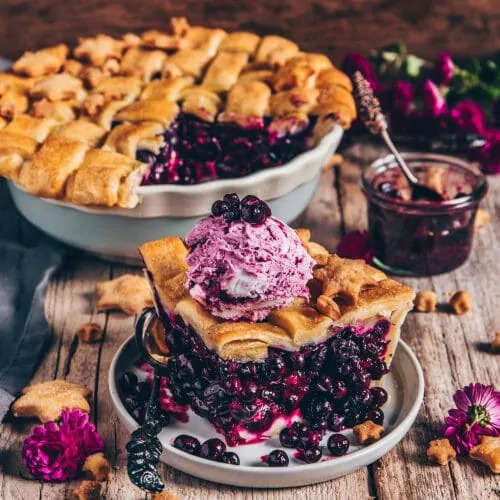 This blueberry pie looks absolutely incredible! Love that it contains so many healthy blueberries.